Low back pain (LBP) is a common occupational health complaint and an important public health concern. Analyzing the association between physical demands at work and occupational outcomes can be useful for improving LBP prevention. 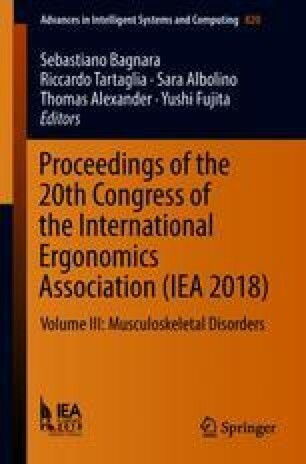 In this study, workers filled out a questionnaire gathering data on socio-demographic and work-related characteristics, general health, LBP (episodes in the last 12 months, pain severity and intensity), and other occupational hazards related with physical demands (DMQ). 735 workers answered the questionnaire (male n = 359). They worked in different sectors. 507 (69%) reported LBP in the last year. The highest proportion of subjects with >6 episodes of LBP per year was found among public services (31.8%) and the lowest among administrative working in offices (10.3%). Most workers reported having sedentary-type work (39%), 34% a low/moderate physical intensity one, and 27% a highly physically demanding one. Results of logistic regression showed that, after adjusting for age, gender and sector: sedentary work (vs. high work intensity) was associated with a lower likelihood of having 3 to 6 LBP episodes per year (OR = 0.4; 95%CI 0.2–0.8), and >6 LBP episodes per year (OR = 0.5; 95%CI 0.3–0.9); low/moderate work intensity (vs. high work intensity) was also associated with a lower likelihood of having 3 to 6 LBP episodes per year (OR = 0.5; 95%CI 0.3–0.9) and >6 LBP episodes per year (OR = 0.6; 95%CI 0.3–1.0). Findings suggest that occupational high physical demands are associated with a higher likelihood of presenting LBP. For Occupational Health Services these results may contribute to design and assess better LBP prevention programs. F. Heranz—Clinical Investigator, Occupational Doctor. Thanks to the support of the Authority for Working Conditions (ACT – Autoridade para as Condições de Trabalho), in particular by funding project 027ESC/13: “Chronic low back pain and Work”. It is also appreciated the collaboration of the companies and their Occupational Health Services, and in particular of all workers and occupational doctors who participated in this study.